In today’s radio-friendly music culture, a laid back and organic musical experience from talented musicians can be the perfect getaway. Spark Seekers: Acoustic Series transforms selections of Matisyahu’s latest studio release into a beautiful, natural, and raw accompaniment to the highly-praised voice of this 33-year-old man. I was lucky enough to get the chance to see Matisyahu on the kickoff of his new acoustic tour at the Texas Music Theater in San Marcos, Texas. While I was there I got to pick up a copy of this work of art for only five dollars. 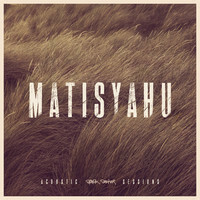 The album starts off with with nothing but guitar playing the intro to “Crossroads”, but Matisyahu is quick to jump in and go through his verse while the sounds of a soft cello softly joins in to add to the momentum of the song before hitting the uplifting chorus. The song then calmly goes back into the verse, with careful attention paid to dynamics this song keeps you on the edge of your toes all the way until then end where Matisyahu’s beatboxing skills give the song a strong backbone and builds the song even more into its sudden end. “Live Like a Warrior”, a personal favorite of mine, follows and does not disappoint. The way each musician plays compliments every pitch that is played by all others, and Matis meshes his vocals with each instrument with pinpoint accuracy. The familiar guitar patterns of “Sunshine” the follows. This song is just as enjoyable as the studio version and features a very minimal bridge that allows vocals to fill up all the empty space. About 3 ½ minutes into the song Matisyahu once again shows off his entertainment abilities by beatboxing and even humming harmonies at the same time. Matisyahu’s message has always been one that inspires many passionate fans, the message of love, hope, and peace. The first time I saw Matisyahu was in front of a large Amphitheater in Dallas and my best concert memory was waiting two hours before doors opened to be front and center for Live at Stubb’s Volume II. Matisyahu’s renown energy and spirit do not die in the acoustic setting, it is just channeled differently. The passion this man normally puts into stage diving and climbing speakers gets transformed into his voice with even more passion and meaning. An Acoustic Evening with Matisyahu is still on the road. The tour and the album have both already been life-changing, seeing this humble man accomplish so much while making everyone around him feel positive and hopeful is an experience you don’t want to miss. VIP Packages are available for some dates which include a soundcheck and a meet and greet. Audience members are also given the chance to participate via a Q&A session in between sets. This tour is limited, intimate, and special. If you are a fan of Matisyahu, it is definitely worth the road trip. *”Silence” is the final bonus track of the iTunes version.